Nice post! Interesting to see this story put to print. We did finally loosely crack the paper during those late night sessions - allowing Robert to do a test impl for n=1. There was still some leaps to be made to generalize those steps for n > 1. After reading this post I am still not understanding any of this code :-) But it works! Really phantastic! I was only trying to help out with beer for Robert and some tiny improvements to speed up sorting in Automaton or generics police the code. It was funny to listen to the discussions between Mike and Robert on the party at Mike's house! Is the built automaton built per segment? If so, does it handle merge from automatons from different segments? Fantastic post Mike! It's really nice to hear about the behind-the-scenes story of how something in the research literature makes its way into Lucene and all the hard work you guys do to make it happen. I'm really looking forward to 4.0! The Levenshtein automaton is actually built once up front, and then "intersected" with each segment's terms, segment by segment. We have a single PQ that's used to merge the terms from each segment, then at the end we take the top terms from this PQ and create the real query (this is in TopTermsScoringBooleanQueryRewrite, in MultiTermQuery). Thanks Tom! It was really quite crazy while this story was unfolding... it wasn't at all clear it was going to have a happy ending! Thanks Otis; I added a link to Robert's slides. Great post! I'm glad that my code could help such a great project. I'm always happy to help. I introduced this post to Japanese people. 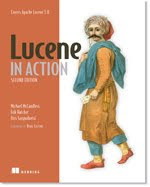 Thank you for writing great story about Lucene. Great post. It reads like a thriller! The way Python code was written to tap into Moman to auto-generate java code that is used by other java code does sound scary. Why not just run Moman on Jython? Also can you briefly explain why N=3 is not practical? Moman on Jython would work, but, Lucene is all Java today, so we wanted to keep that. Is there some reason you didn't contact the authors of the paper with your questions? Seems like they would have been happy to help, or at least put you in touch with a graduate student who could translate the paper for you. It is scary! So basically you guys magically have what you need by translating someone's code without neither understanding of the method and the original code? Well, we did really have a basic grasp of the paper, but translating that theory into actual Java code, in practice, was tricky. I over-dramatized things somewhat... we do have enough of an understanding to believe it's correct. Furthermore, the tests we created are strenuous, and are exhaustive in that we test the different possible characteristic vectors, so if the paper is correct, the algorithm we implemented should be as well (famous last words I know...). Are you allowed to simply copy rewrite the Python code into Java and contribute it to the Apache Software Foundation like this? Is this what you did? If so, even though the Python code has an MIT License, the work is still copyrighted by the original author and how you have done this seems messy from an intellectual property point of view. Generally speaking, you can not simply rewrite someone else's work even though it has an MIT license and contribute it to the Apache Software Foundation. First, Moman's license is the MIT/X11 license, which Apache projects are free to incorporate in source and binary form (see http://www.apache.org/legal/3party.html) as this license does not remove any rights from ASL2. Second, the Moman package is being used only as a library by the code generator we (Lucene developers) wrote; none of Moman's sources are incorporated into Lucene (only the generated Java code as a result of running the generator, and our Python code generator). In theory, Moman's license has no bearing (much like the license of a compiler doesn't apply to the binaries it produces). But, finally, to be sure, we contacted Jean-Phillipe to confirm he was the sole author of this package, and he was OK with our usage of it (he was), and we've also added Moman's copyright and license in Lucene's LICENSE.txt file. Excellent work. A nice demonstration of how university research can help solve read world problems. There's also a native Java implementation of the Mitankin paper. Could you help me to understand how pre-building a Levenshtein Automaton (for terms?) can avoid scanning all terms on run time? Pre-building the Levenshtein automaton changes the problem from "test every term" to a graph intersection problem, ie, we intersect the graph (Levenshtein automaton) with the terms in the terms dictionary by using seek/next APIs already available in Lucene. In fact, at some point we should add an intersect() method directly into Lucene's APIs, because some terms dict representations can potentially do this more efficiently than seek/next. As I can not fully understand your above explaination, I have the following questions which might be stupid. 1. Suppose we have n terms in the terms dictionary , do we have one graph or n graphes? 2. Why using seek/next APIs can skip some terms? I do think that we have to calculate the intersection for all terms. You have 1 graph created, from the fuzzy query's term plus edit distance N. This graph is the Levenshtein automaton. You then intersect that graph with the terms in the index, by iteratively seeking to the next possible match. This seek is able to skip terms because chunks of the terms space cannot possibly match. For example if your query is foobar~1 (ie, edit distance 1), and you are at terms starting with foba, you know the only possible match with that prefix is fobar so you seek there, possible skipping fobaa, fobap, fobaq, etc. Great post! And would highly appreciate it if u can give some concrete benchmark results. Je suis récemment tombé sur votre blog et ont lu le long. Je pensais que je quitterais mon premier commentaire. Je ne sais pas quoi dire sauf que j'ai apprécié la lecture. Blog de ​​Nice, je vais continuer à visiter ce blog très souvent. Great post Mike, really interesting insight into upcoming Lucene 4.0 Fuzzy search. Looking forward for 4.0 ! I'm really glad to see someone picked up the paper from Klaus Schulz and Stoyan Mihow. When I first read it in 2007 or 2008 I didn't understand much more of it than it's potential. Thanks for your efforts coding it within lucene - I would never be capable to do so. I'm really waiting to see multiple token fuzzy matches in Action! I just stumbled upon this very interesting blog post and have a question: doesn't the complexity of the generation of the Levenshtein automaton in terms of time and storage depend on the used alphabet? I mean, generation of the automaton for the Latin alphabet with its 26 letters may be easy and efficient, but what about Unicode? Having an alphabet with hundreds of thousands of letters must complicate the situation dramatically, no? FST (but it's not implemented "generically"). edit distance in UTF16 code units. characters (ours, poached from http://www.brics.dk/automaton, does). Keep in mind Unicode is a living standard and the tables should be reviewed yearly. That's fine: how the Unicode Consortium assigns Unicode characters won't affect FuzzyQuery's implementations. The tables we use to generate the Levenshtein automata are agnostic to the binding of each character: they simply accept any int up to Character.MAX_CODE_POINT. It's quite fast now ... you see see the nightly benchmarks (http://people.apache.org/~mikemccand/lucenebench/ ) ... ~ 30-40 QPS on the full Wikipedia index. We also now have a DirectSpellChecker that runs a FuzzyQuery minus visiting the matching documents. This is nice because it avoids requiring the "sidecar" spellcheck index that's necessary with the old spellchecker. Its really a nice post. I have a confusion here regarding Fuzzy Query. Since Solr 4 is supporting fuzzy searches using Edit Distance which needs a parameter i.e. N which can have values as 0 or 1 or 2(max). So, why are the values like 0.4,0.6..till 1 are still supported and 1.5,2.2.. are not ? How does it makes sense ? Is it just for backward compatibility or there is something that I am missing ? I believe a value > 1 is supposed to be an integer edit distance, while a value <= 1 is allowed to be the legacy similarity measure (which under the hood is changed to an edit distance based on the length of the query term). But maybe ask this question on java-user@lucene.apache.org to be sure! I have asked question to java-user@lucene.apache.org. As per your reply, what I understand is, the values between 0 to 1 are still allowed so as not to make changes in the way lucene is queried in case of fuzzy matching. And the values like 1 or 2 are supported to provide a parameter for fuzzy search explicitly(where we can specify the number that signifies the edit distance between source and target strings , however value between 0 to 1 also does the same thing but with some internal calculation). Please correct my understanding if wrong. I couldn't find your email to java-user ... what was the subject line? Your understanding is exactly right! I am using Solr 4.2.1. Only fuzzy search is not fit for me as I can at max provide ~2 (edit distance) as fuzziness factor in query and only Phonetic will also not work as there are some words for which encoding in DoubleMetaphone completely changes with the change in a single character. And also I came to know that with fuzzy search all the query time analysis is by passed. So I am unable to find a way to have both together. If there is no such way to have both together then is the approach I have in mind is correct or not ? This is certainly possible with Lucene: just analyzing the field with a phonetic analyzer, do the same at query time, and create a FuzzyQuery from that. But it sounds like you need to know how to do this with Solr? I'm not sure ... did you already email the solr-user@lucene.apache.org list? first of all thanks for this awesome blog! I'm currently facing the exact problem as described here. Now I want to analyze the input at query time but I'm not quite sure how to do so. Do I analyze a single String and return the analyzed version? Maybe send an email to java-user@lucene.apache.org? Or, solr-user. In the old Fuzzysearch, the system examined every 'plausible' candidate and computed the actual Levenshtein distance -- an expensive computation for each candidate to decide whether it was within N. Whereas in this new one, it uses a new data structure (the autoaton/table built specifically for the current query) to check whether every 'plausible' candidate is within a distance of N.
That's correct, except with the approach in 4.x, since we pre-compile the space of all terms within edit distance N of the target term into an automaton up front, visiting the matching terms is a much, much faster process (just an intersection of that automaton with the tree structure of the terms in the terms dictionary). Many thanks for your response. However I didnt understand what you mean by pre-compile since the target is a runtime query. What I meant by pre-compile is, for each query, we build the automaton accepting all terms within edit distance N of the query, up front. After that it's a fast intersection with all terms. iam working on OpenNLP with SOLR. I have successfully applied the patch LUCENE-2899-x.patch to latest SOLR code branch_4x. I desgined some analyers based on OpenNLP filters and tokenziers and index some documnets on that fields. Searching on OpenNLP field is not constant. Not able to search on these OpenNLP designed fields in solr schema.xml properly. Also, how to use payloads for boosting the document. Hi, you should ask on the Solr user's list (solr-user@lucene.apache.org). The second approach should be very similar to the SpellCheck FSA approach. So it's faster to use (2)FST or the (1) Byte prefix filter ? From the point of view of memory? I think suggesting via TermsEnum is typically slow; most of our prefix-based suggesters use FST since it's so efficient at doing a prefix lookup followed by "top N paths by score" search. Thank you very much, I don't think number are important in this moment for me, it's nice to know that the FST one is faster ! No, the algorithm from the massive paper directly constructs a deterministic automaton.